Most women have cravings of some sort during pregnancy, and strange as they may be (pickle, pretzel, potato chip, peanut butter, strawberry ice cream anyone? ), they’re not usually life-threatening. But some women suffer from a strange pregnancy craving condition known as pica, which is a craving for non-foods (dirt, clay, cornstarch, etc.) 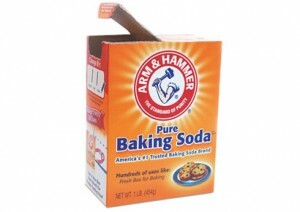 Generally, interventions are made before the craving gets out of control, but one woman suffered such serious heart and muscle complications from her 1-pound box of baking soda per day that she could have lost her life. The 35-year-old expectant mother showed up at the hospital during her 37th week of pregnancy. She told doctors that she was suffering from weakness and dizziness. Originally, doctors diagnosed her with an irregular heartbeat and muscle weakness in her legs. She also had low levels of potassium (an electrolyte that is vital for the proper functioning of nerves and muscles, particularly the heart muscle. “The low potassium levels explained why she was weak,” and why she had an irregular heartbeat,” Dr. Thomas Myles, co-author of the report and a professor of obstetrics, gynecology and women’s health at St. Louis University in Missouri. But what doctors couldn’t figure out was why her potassium levels were low in the first place. “I had seen a patient who was weak from overdoing caffeine, so I thought about diet,” Dr. Myles said. He said he’s also familiar with pica and its symptoms, but because the expectant mother hadn’t disclosed any unusual dietary cravings, doctors couldn’t come up with a reason for her symptoms. Then, as doctors were trying to figure out what had caused her symptoms, the expectant mom developed a rapid heartbeat. The immediately rushed her to the intensive care unit and delivered fluids and electrolytes. They also conducted some more tests, which revealed that her condition was becoming life threatening. In addition to her other problems, the woman had high levels of creatine kinase, an enzyme that suggests condition known as rhabdomyolysis, which causes a breakdown of muscle fiber. If untreated, it can lead to kidney issues. An echocardiogram revealed that she also had dilation of her left ventricle, which suggested that she had a peripartum cardiomyopathy, a condition that occurs when the heart muscle weakens and is unable to pump blood efficiently. This condition occurs in about one in every 1,300 to 5,000 birth, and is generally diagnosed within five months of delivery, according to the National Institutes of Health. Though they still didn’t know why she was suffering from all of those conditions, doctors knew they needed to take action to save the life of her and her baby. They placed her on heart medication, gave her a blood transfusion, and induced labor. She ended up delivering a healthy 5lb, 4oz baby boy on the fifth day of her hospital stay. After the delivery, treatments continued to improve her creatine kinase levels. But no matter what they did, doctors couldn’t seem to raise her potassium levels. Nurses and doctors continued to ask her about her dietary habits, but it wasn’t until days after birth that she finally admitted that she’d been taking a hefty daily dose of baking soda for years to treat hiccups. She admitted that she’d even consumed some while in the hospital. “I suspect she felt a little guilty that her symptoms were self-induced,” Dr. Myles said. But no one seemed to blame the mother. They simply told her that she needed to stop eating the baking soda and placed her under close watch to make sure that she complied. Once she stopped using the baking soda, “it [was] it a lot easier to treat her,” Dr. Myles said. In just one day, her potassium levels returned to normal, and she was then discharged. After leaving the hospital, the new mom continued to see a cardiologist. Three months later, an echocardiogram indicates that she still suffers from mild cardiomyopathy. All of her other symptoms, however, have completely disappeared. “As soon as you get away from the offending trigger and stay hydrated, muscle becomes stable and rebuilds,” Dr. Myles said. Though pica may seem like a benign condition, this is an example of just how serious the condition can become. If you find yourself craving or consuming non-food items, talk to your doctor as soon as possible. Larry and Dannielynn Birkhead Attend The Smurfs 2 Premiere!